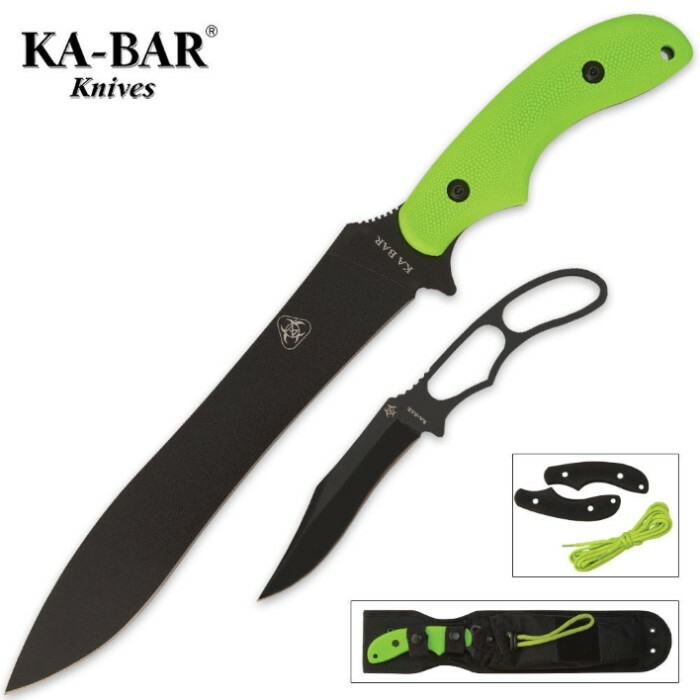 KA-BAR®'s ZK (Zombie Killer) Knives are designed to perform under the most rigorous, unexpected conditions, from the campsite to tactical missions to the zombie apocalypse! The KA-BAR® ZK War Sword is a straight edge fixed blade sword, constructed with a non-reflective black powder coated SK5 steel blade measuring a full 9 3/4” and has an overall length of 15 1/8”. This sword features a textured GFN-PA66 handle and includes an extra set of black handles plus a nylon sheath with front stuff sack and draw cord. I just got this today. It comes fairly sharp. The blade is a lot thicker than I thought it was going to be and I like that. It's a great knife, the only downside I see is the handle, it is slightly awkward to hold but I'm quickly getting used to it, also what the handle is made of what seems like it might become slippery but there are multiple ways to fix that so not really a big problem. Overall this is an awesome knife and I suggest you get it.